As you likely already know, the Jackson Hole valley has a vast array of gorgeous areas with stunning views, but it can be tiring to hike to many of these areas. Although it’s not for everyone, horseback riding is a great solution to avoid this excessive hiking and there are a number of various outfitters around the valley that are more than equipped with the knowledge and trusty steeds to take you on a great adventure. 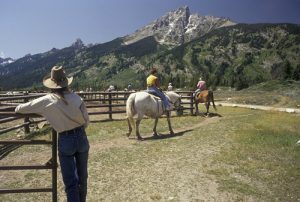 When considering horseback riding in Jackson Hole there are several outfitters and types of trips to choose from. For example, you may be interested in riding for just a few hours, a few days, or even a multi-day camping trip. As far as the different outfitters are concerned, each one has its own specialties, whether you want to simply take a short ride near the town square or get further away in the surrounding wilderness areas. We decided to break down some of our favorite options for you. With trips leaving every hour between 8 am and 5 pm there is plenty of opportunity with this outfitter to get trips in. Most of their trips all take place on the property of the beautiful and historic Snake River Ranch which is located right across from the Jackson Hole Mountain Resort. They offer 1, 2 and 4-hour trips, with the 4-hour trips taking place on Munger mountain, about 10 miles south of the ranch. Trips range in price from $45 to $100. Spring Creek Ranch’s horseback riding trips take you atop the East Gros Ventre Butte with the Teton Range as your backdrop. 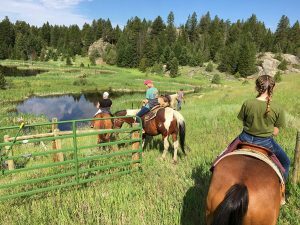 Similar to Teton Village Trail rides they offer trips on the shorter end of the spectrum with 1 and 2-hour ride options which are $49 and $69 respectively. Aside from the basic horseback trips they also offer a 2-day package trip in conjunction with Jackson Hole Whitewater where you can combine trail riding with a view-filled meal at the Granary as well as a choice between either a fun and exhilarating whitewater rafting trip or relaxing scenic float. This outfitter is perfect for those looking for more than a brief 1-hour trip, as they offer 2-hour, 4-hour, full day, and pack trips by request. If you are looking for a full day trip they have three different options including a ride from the ranch into the Gros Ventre Wilderness, a ride into the Hoback/Granite area where you can see herds of Elk and their babies, and lastly a fishing trip into the Willow Creek area in the Bridger Teton National Forest. Prices range from $80 for the basic 2 hour trip to $450 for a Pack Trip.